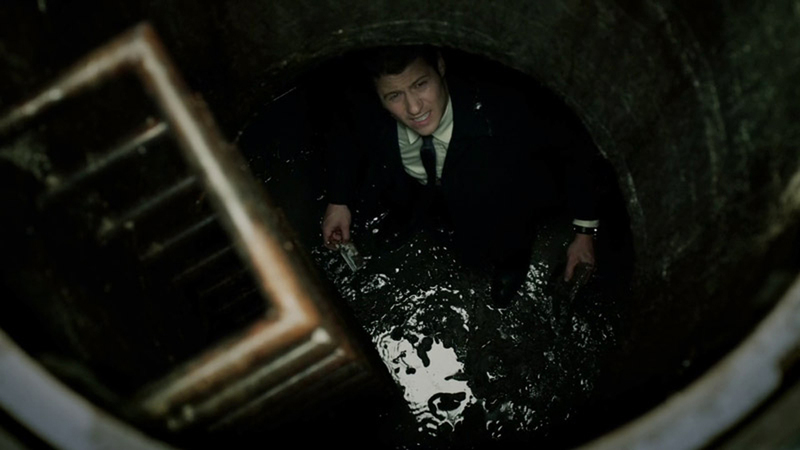 Another episode, another rewarding view of the bowels and dark depths of Gotham, and the show’s crazy logic at work. More specifically, a look at how a random assassin — a vigilante who’s killing Gotham’s most notoriously corrupted figures — gets cheered by the Gothamites, who feel that a cleansing of the corrupt is indeed in order. 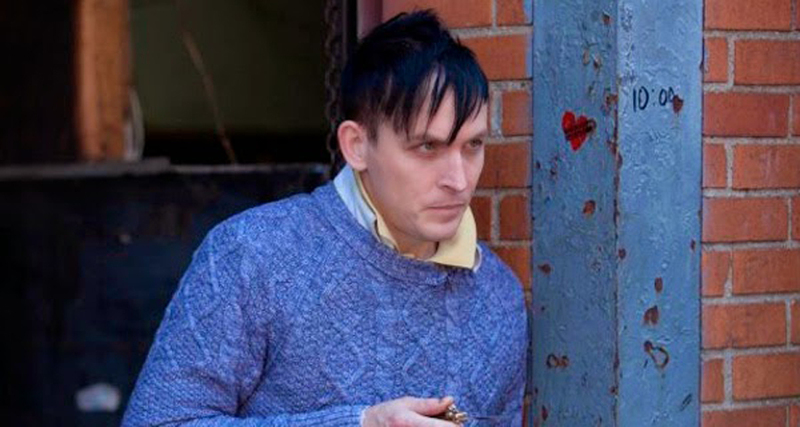 If Gotham’s colors, feeling, and very comic-book-y mood were clear highlights in previous episodes, this time around, from the very first scene with the “triumphant” return of Oswald Cobblepot (Robin Lord Taylor), that perfect mix of grays, petty crimes, loud noises, dirty streets and chaos all over makes you feel that what came before was no coincidence. Gotham’s writers just nail what the world of Bruce Wayne (David Mazouz) is all about, hinting at how this particular city couldn’t help but create any vigilante other than Batman, as crazy as his surroundings. With last episode’s cliffhanger we were promised significant developments on the Selina Kyle (Camren Bicondova) and Detective Jim Gordon (Ben McKenzie) team-up to solve the murder of the Waynes, but it seems we were played a bit. Yes, there is a team-up and a return to the scene of the crime, but Detective Gordon manages to make a fool of himself as he underestimates Selina’s abilities. Cat says she briefly saw the killer’s face, though she leaves the Detective down in a sewer and with no description of the suspect. Back to square one, more or less. I’ll bet little pieces of the puzzle will be unraveling until the season finale, possibly with a heavy Carmine Falcone (John Doman) presence. This episode, however, marks a milestone or two, which might be important for how the dynamics of the series evolve moving forward. First, we’ve got Jim Gordon facing, once more, a demented Gotham; one where everyone who is crooked is a target for the Balloonman vigilante; and therefore most of the public figures stay indoors. For Gordon it has been a slow build, seeing first-hand as Detective Harvey Bullock (Donal Logue) was corrupt, violent and Mobster-friendly, then learning that those traits ran much higher up the chain of command, even to the Mayor himself. Finally, here, after an intense episode of butting heads with Captain Sarah Essen (Zabryna Guevara) and Bullock, it is from the lips of a brought down Balloonman that Gordon realizes that all of Gotham is corrupt, and how naïve he had been, playing the good cop all along, trying to overcome those who didn’t. We will see how this revelation changes the way Gordon faces Gotham and its ways. I feel it was a necessary milestone in order to have both the character and the series evolve, while dancing around the same themes. The other milestone is related to the first, as it has to do with Barbara (Erin Richards) trusting that Gordon has not succumbed to the GCPD’s crooked ways, despite what her former lover Officer Renee Montoya (Victoria Cartagena) might think or say. Barbara is given some back story, and her character matters more in this episode than in previous ones, even sharing a tender scene near the end where she realizes Jim Gordon would never do all the things he’s been accused of — like killing Cobblepot, something that in time will reveal itself to be a stunt by the cop to gain the GCPD’s and Falcone’s trust. The Alfred Pennyworth (Sean Pertwee) that viewers get this time around is more akin to the character in the comics, as we are shown how he and little Bruce are learning to live, if only with a few scenes. This time, we get another nod to the future – Batman being the world’s greatest detective and all – as Alfred stumbles upon the police files of the Waynes murder, which the boy had been keeping, in order to perform his own investigation, and, surprised, points out the how the kid’s trying to become a detective. I’m liking the portrayal of the young Bruce, and I hope he becomes more prominent as the series evolves. Oh, and there’s also room for more Oswald Cobblepot greatness! This guy sure is creepy, and the writing knows how to exploit the character, focusing on him being devoid of any empathy, which makes killing easy as pie for him. It’s just a way to get to the top, where he thinks he deserves to be. On the way there he might have to work at the Italian restaurant which, funny thing, is a front to Mobster Sal Maroni (David Zayas). With a great cliffhanger, Gotham remains strong, and that’s just the beginning, because…Arkham is coming!